Dubai's Roads and Transport Authority (RTA) has signed an agreement with Brand Dubai, the creative arm of Government of Dubai Media Office (GDMO), to undertake beautification projects across the city over the next three years. Under this pact, both the organisations will establish strategic co-operation to implement public art projects aimed at enhancing the city’s aesthetic environment, said a statement from RTA. The beautification projects will cover bridges, tunnels, walking tracks, bus stops and other public facilities and areas throughout Dubai, it stated. Mattar Al Tayer, the director general and chairman of the board of executive directors of the RTA, said: "We are very happy to partner with Brand Dubai to execute this unique urban beautification project in Dubai. The RTA is committed to working with diverse partners to enhance the urban experience that Dubai offers both to residents and visitors." "The RTA is also keen to ensure that all its projects incorporate an aesthetic dimension. The unique designs of the Shindagha bridge, which features an architectural arch in the shape of the symbol of infinity, the oval-shaped ‘Bridge of Tolerance' and the Dubai Metro stations are examples of this," noted Al Tayer. 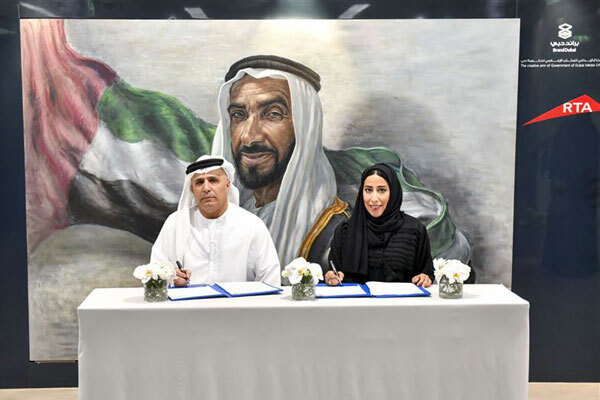 Mona Al Marri, the director general of the GDMO, said: "The collaboration with the RTA to launch beautification projects across the city is aligned with the vision of HH Sheikh Mohammed bin Rashid Al Maktoum, the Vice President, Prime Minister and Ruler of Dubai, to turn Dubai into an open-air museum that celebrates art, creativity and aesthetic excellence." "We thank the RTA for partnering with us to deliver this project and their commitment to this initiative that aims to revitalise public spaces in our city. Both our organisations bring significant capabilities to this partnership. By combining our strengths, we have a great opportunity to further enhance the artistic and cultural environment of Dubai," noted Al Marri. Nehal Badri, the director of Brand Dubai, said: "Working with outstanding local, regional and international artists, our joint project with the RTA aims to add a new creative dimension to public spaces in Dubai." "Through unique artworks, ranging from murals to installations, we seek to tap into Dubai’s unique spirit, character and heritage, and in the process inspire greater engagement, inclusiveness, and innovation in the community," noted Badri. "These artistic creations will look at Dubai’s culture and history, and its ambitions and aspirations from a fresh viewpoint. Overall, the project will significantly enrich the experience of the city for both residents and visitors," he added. Moaza Saeed Al Marri, the director of marketing and corporate communications at the RTA, said: "We back all efforts of Brand Dubai to enhance the urban landscape of the emirate. These not only support the vision to transform Dubai into an open-air museum but also deepen engagement between the city and its residents and visitors."